So, I’ve pretty much completed my first play through of Borderlands, solo. 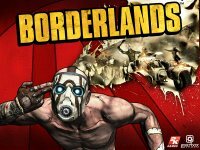 Borderlands is playable as a solo First Person Shooter, but is really intended to be played co-operatively with up to 4 players. Graphically Borderlands has a distinct style, slightly cartoon-y, and with an intriguing focusing system that sharpens up the detail when needed and leaves it a little fuzzy when you’re looking around or moving quickly. The detail in the level designs is amazing, with lots of clutter/junk to give a sense of life to the alien world that you are travelling through. Sound is equally good, a well-balanced score, with some good up tempo combat/event music. Weapon and creature sound effects are well done, and the great voice acting is one of the first cues to the humour that runs throughout the game. AI is ok, most enemies tend to charge straight at you, even the humans, although they will use cover and grenades at higher skill levels. Gameplay-wise, the game structure is similar to an MMORPG, but without any real ‘grinding’ issues and minimal traditional RPG elements. If you play through all of the story missions and the side missions you should never have an issue with being too low level to tackle the next available missions. The primary RPG elements are in each character’s ‘action skill’ broken into 3 paths of 21 skills (each skill has 5 levels), plus the bonuses that weapons/items give you in both ‘normal’ and ‘elemental’ bonuses. All in all a good game with currently 3 DLC updates adding new zones and a 4th expected. I wish that I’d been able to go through this in co-op with a few friends, I expect that that makes it an even more fun experience. This entry was posted on April 20, 2010, 12:05 pm and is filed under PC, Reviews, Video Games. You can follow any responses to this entry through RSS 2.0. You can leave a response, or trackback from your own site.